Polypropelen is a man made Carpet fibre. It can feel surprisingly similar to wool and comes in various styles, from hardwearing loops, stylish twists & sumptuous saxonies. All are inherently stain resistant and durable. All this, with prices start from as little as £5.99 per sq m.
Mostly used in mid to high range quality carpets, it gives the best of both worlds - the softness of the wool mised with the durability of nylon. Wool rich twists are available in plains, mottled, and naturally stain resistant. Pile weights ranging from 30, 40, 50 & 60 ounze per square metre. 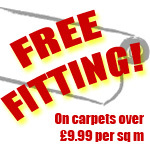 Wool carpets are the natural choice, and with prices starting from £15.99 per sq m they won't break the bank either. From modern loops pile to complement any designer look, to chunky Saxony's & twists in cutting edge colours wool is the all-round choice. Underlay is so often overlooked but is extremely important to a new carpet & should be replaced when fitting a new carpet. Modern P.U Underlays give a fantastic feeling of luxury underfoot & are guaranteed for the life of the carpet & unlike rubber underlay will not crumble. Underlay is the perfect companion for any new carpet, and it won't break the bank either - unlike national companies, our range of underlay starts from just £3.99 per sq m.